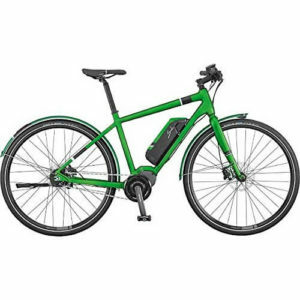 The Scott Bike brand know exactly what their consumers want when it comes to electric bikes which is why their Scott Bike Electric Bike (Learn More Here!) is popular among plenty of electric bike fanatics. It isn’t the cheapest brand of electric bikes but it’s certainly one that does everything it say’s on the tin. The Scott Bike Electric Bike comes with many features that will make your riding experience even more enjoyable, and along with the fact the bike looks modern in general is just another reason to add this bike to your household. Whether you are a serious electric bike fanatic or just a new user, this electric bike will work wonders for your cycling requirements, whatever they may be. Massive wheels – The wheels are manufactured by Syncros so you know you are going to have a pleasure riding this bike. The wheels themselves are 27.5” and 2.25” thick so you know there isn’t going to be one terrain out there that this bike cannot handle. The treads on these wheels speak for themselves and will provide you with the ultimate grip no matter what terrain you come across. Best braking performance – This electric bike consists of top quality brakes in the Shimano brand so you know you are going to feel safe at every turn knowing you can stop quickly and effectively. The disc brakes will provide you with the most effective of stopping at the shortest of distances no matter how quick you are travelling. Mudguards – Matching mudguards are included and they really compliment the overall design of this electric bike. The mudguards will ultimately keep you clean and dirt free when travelling to work or places where you need to be clean upon arriving. The mudguards are an expensive brand so you can be sure you are getting quality with every part of this bike. Comfort in mind – This electric bike was designed with the ultimately comfort in mind. This is why they have implemented and expensive seat design into the bike so you can be sure that wherever you are going you are always going to be comfortable and enjoy the ride in question. Kickstand – There aren’t many kickstands included with electric bikes these days but that just shows you how much Scotts Bikes have thought about their overall design. It might only be a simple feature but it is one that can be beneficial to the users that have to put their bikes outside stood up against something – the kickstand ultimately stops the biking from rubbing against another object. STEPS Crank Motor – The powerful motor included within this bike is the well-known Shimano 400Wh STEPS Crank Motor. You can be sure you are going to arrive at your destination quickly and efficiently thanks to this motor, and you’ll surely enjoy your ride. The motor included with this bike is one of the most powerful within an electric bike which is why the overall price is a little hefty. Multiple gears – If you are one of those people that likes to travel in a variety of terrains, this bike will allow you to do just that thanks to its implementation of an 8 speed electronic hub gear system. You will find travelling a lot easier and you will be in full control of every movement. In terms of design, an electric bike couldn’t look any more nice and modern, and it is truly complimented with multiple components such as the mudguards and pedals, so you can be sure that wherever you are travelling to you are always going to turn heads. Everything about this bike is appealing, from the big 27.5 inch tyres to the powerful 400Wh motor that will take you far and wide. There isn’t a lot this bike hasn’t got and with the fact the price is a little extortionate makes this a bike for the serious electric bike enthusiast. This electric bike has plenty to offer in terms of features and if you are looking for a high-end electric bike that is going to certainly turn heads then this could be the product you have been looking for. Of course, this bike is expensive but if you have the money to purchase an electric bike then this one should definitely be considered.